These recipes will make you have a gourd time! Let's spread the word: Pumpkin makes everything more delicious! Not only are pumpkins abundant during the fall season, they also offer a huge array of nutrients. Happily enough, it’s also incredibly versatile and easy to prepare. So, are you ready for a new way to enjoy this seasonal favorite? Get some inspiration from these six delicious ways to use pumpkin! Pumpkin is a wonderful ingredient to give your fall salad that certain something and a gentle bite. This one below combines the outstanding flavors of somewhat sweet pumpkin, curry roasted chickpeas, and mustard dressing with crisp apple and baby spinach—just perfect! A hearty pumpkin sauce is a great way to switch up your pasta routine. It’s prepared in no time and the perfect dish to warm you up on a stormy autumn day. Having said this, we have to warn you: This creamy sauce is addictive and you better not eat it in public, because you probably want to lick your pasta plate clean! 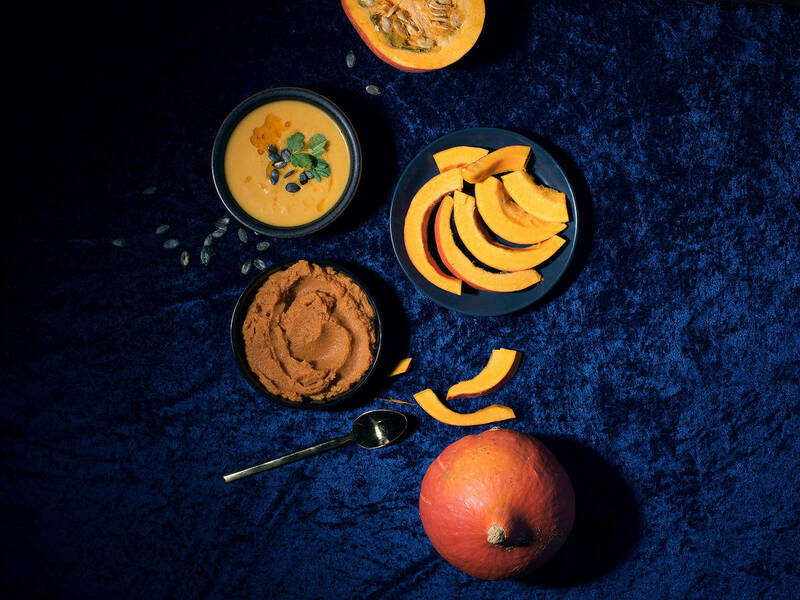 There’s no fall without a delicious warming and invigorating pumpkin soup (even if we have to admit that we could eat it all year long)! Try out this creamy pumpkin soup with coconut milk and curried carrots. It’s the ideal colorful and vivacious kick-off for the season. While mashed pumpkin is a very common side for any kind of dish, you have certainly never tried out a pumpkin sugo before. Served with a cut of venison, this hearty pumpkin sugo is the right dish to please and even impress your dinner guests. Ever tried to make your own pumpkin purée? If not, it’s about time! It’s just so easy to make and can be used for so many dishes like cakes, sauces, breads, soups, and more. Fancy using your delicious homemade pumpkin purée immediately? How about some tasty pumpkin pie squares? These healthy sweet pumpkin squares are putting a new twist on the traditional American holiday pumpkin pie. With their smooth and tasty pumpkin filling, they’re just what you need to get in the mood for fall. What’s your favorite way to use pumpkin? Tell us in a comment, or send us your recipe to community@kitchenstories.com and we'll share them with the community.